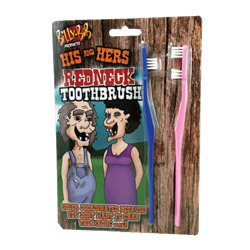 Save time polishing your chompers with the His & Hers Redneck Toothbrush Set! Got a few empty spaces? Not to worry. These brushes will keep your pearly whites happy and healthy - no matter how many you have! Set includes one pink and one blue toothbrush with only a few bristles each.